Want to be notified of new releases in WernerFP/Shades-of-gray-theme? 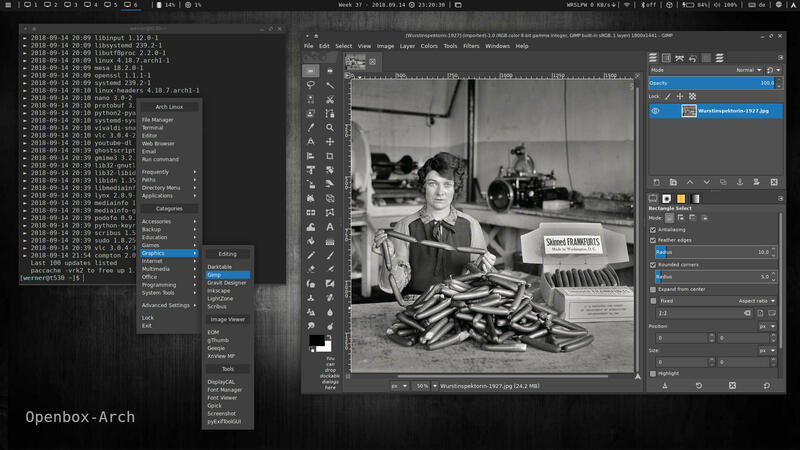 The following description with further information is part of the file Shades-of-gray-Readme.html, contained in the Shades-of-gray theme folder. If you want to benefit from the latest upstream changes, it makes sense to install the Git version. In GitHub commits you can check if there are changes since the latest release that can be useful for you. Note: Existing installations of Shades-of-gray are overwritten by the last command. If Shades-of-gray was previously installed using your distribution‘s package management, the package should be uninstalled first. Copy the chosen theme folders either for personal use into directory ~/.themes/ or for common use into /usr/share/themes/. 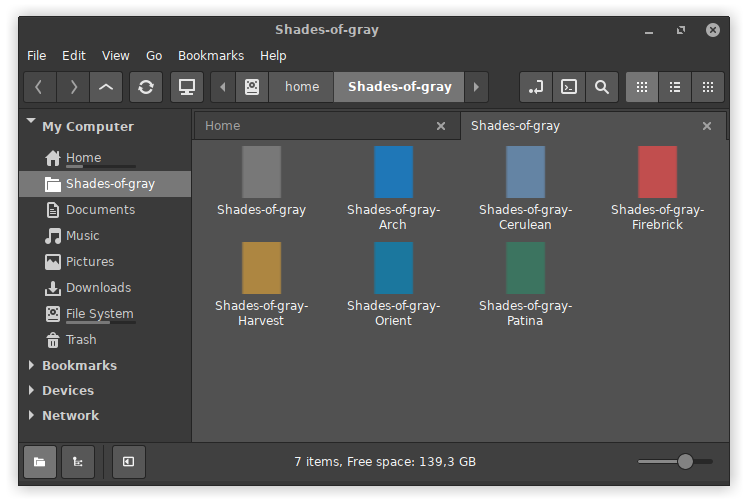 Shades-of-gray can also be downloaded from openDesktop.org. Each theme folder contains an app-gadgets directory with additional theme files for Thunderbird, Firefox and Inkscape. If you change a Shades-of-gray theme color, it is not necessary to copy the file again. You can simply comment the current theme color in userChrome.css (Thunderbird and/or Firefox) and uncomment the new theme color value. Thunderbird‘s Calendar (formaly Lightning) is using its own bright colors in default setting. The option for using theme colors is hidden as 'Accessibility'. 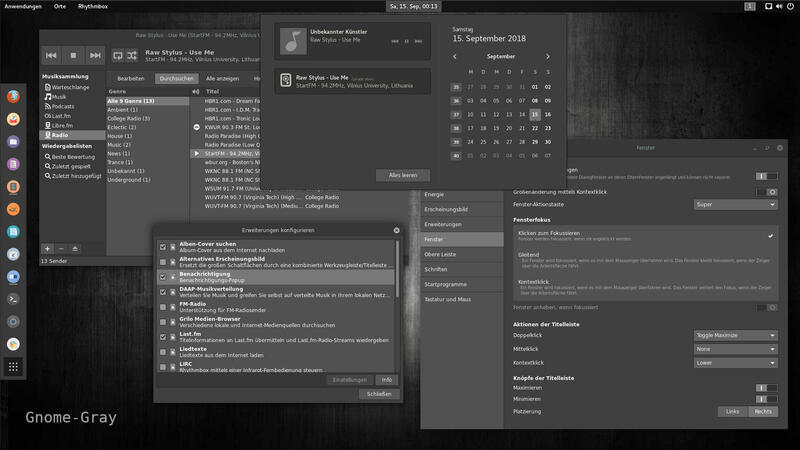 Open the Thunderbird settings and activate the checkbox 'Optimize colors for accessibility' in calendar area. Additional options are included at the end of the file userChrome.css (e.g. to hide unwanted items in context menus). You can activate options of your choice by removing the comment characters /* at the beginning of a line. Note: You should choose the dark style in Firefox to get a consistent dark appearance. 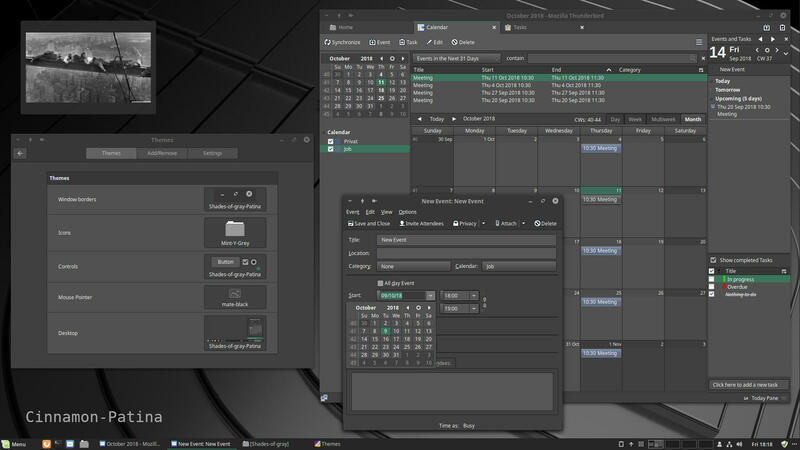 Firefox uses widgets of the current GTK3 theme in websites that have not designed their own widgets for forms. With dark themes this is ugly and input fields, checkboxes etc. are difficult to use (e.g. black font in dark input fields). To fix this behavior the file userContent.css contains color-neutral form widgets. This file also contains theme customizations for the New Tab page (about:newtab). Note: In Panorama Tab Groups you can toggle between light and dark theme. 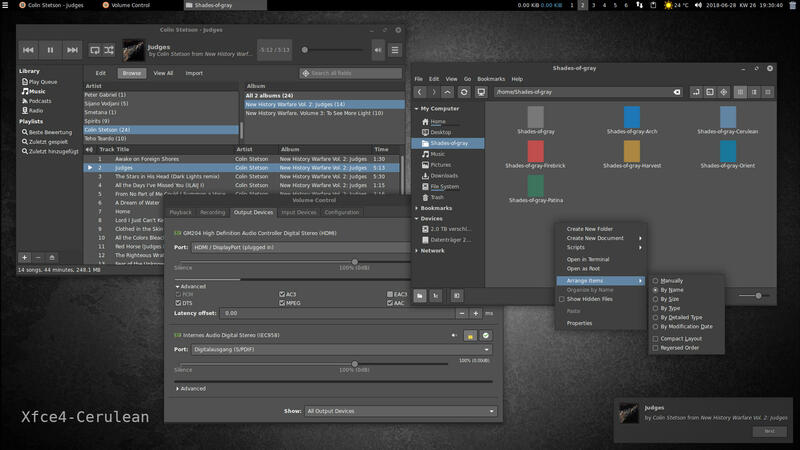 The Shades-of-gray customizations only take effect with the dark theme. The directory ../app-gadgets/Firefox-Shades-of-gray/bookmarked-speed-dial-images contains images wich you can choose as 'Default dial image' and 'Default folder image' in the add-on options. Note: not all symbols can be customized because Inkscape is partly using standard GTK symbols (🐞). Shades-of-gray includes the syntax color scheme Shades-of-pastel for several editors. By using pastel colors on dark background like pastel chalks on a blackboard the Shades-of-pastel scheme provides balanced and easy on eyes contrasts. Now you can select Shades-of-pastel as a color scheme in menu Preferences. Shades-of-pastel is now available in the settings of your editor. Turn on syntax highlighting (syntax on) in your configuration file (~/.vimrc) and append the line colorscheme shades-of-pastel if you want to use the Shades-of-Pastel scheme by default.